Some great fishing in and around Sooke this week, it looks like South Vancouver Island waters have good early season fishing once again. Trevor from No Bananas Fishing Charters has had some fun days lately. Last week he had success fishing Albert Head for salmon, with 8 spring salmon up to 12 lbs. Purple haze hootchie was the killer and the pink haze a close second. 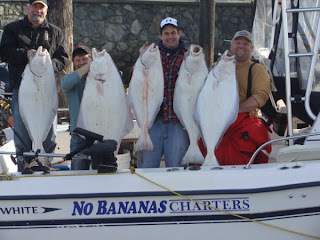 For halibut, some great action with 8 fish to the side of the boat in a 5 hour charter -- 25-40 lbs, caught on herring and mackeral. Today, he headed out to the 3 humps off the Border Bank at daylight. 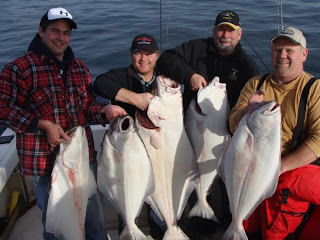 After getting the anchor out and the first rod down by 715 am, the first halibut was on by 730 and they just kept coming. They had their 5 fish in the boat by 930 and even released one around 25lbs. The halibut were caught in 250 feet depth and all baits worked well, octopus ,salmon bellies, herring and mackeral. Steve from Seawind Fishing Charters reported good fishing at Jordan River last week. Fishing in only 100 feet of water, he caught 5 one day (15-25 pounds, with one BIG one lost halfway up) and 7 the day before (15-40 pounds). All halibut caught on herring and mackerel. Steve also reported four hatchery spring salmon caught at the Trap Shack, 15-22 pounds, in 70-90 feet depth, on anchovies and spoons.